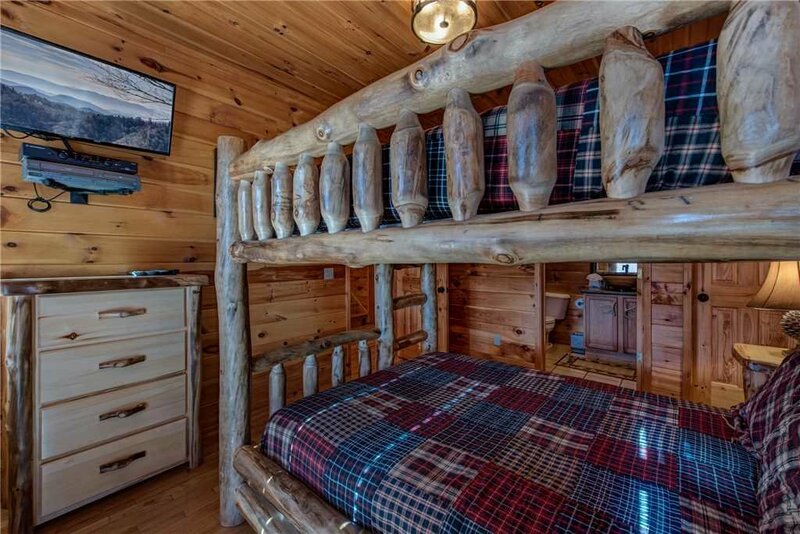 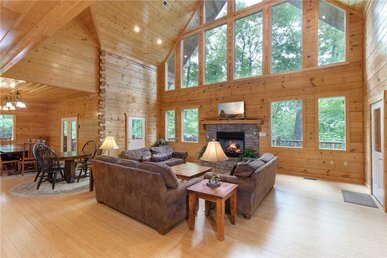 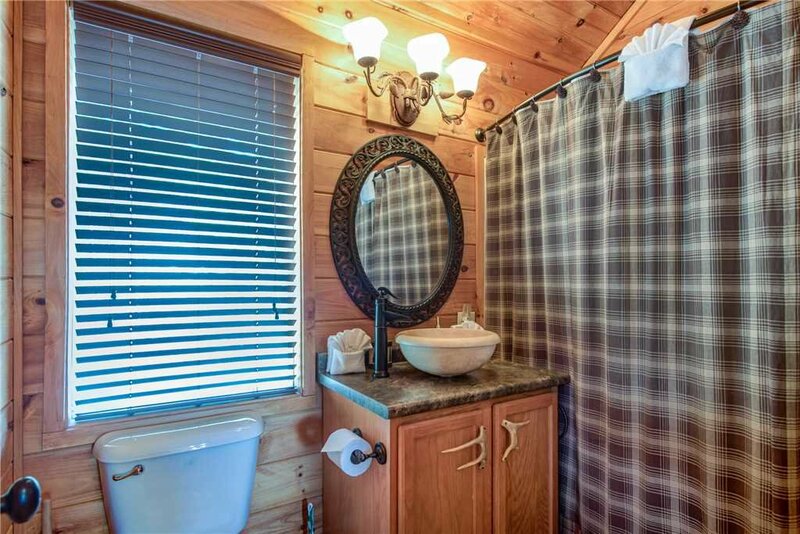 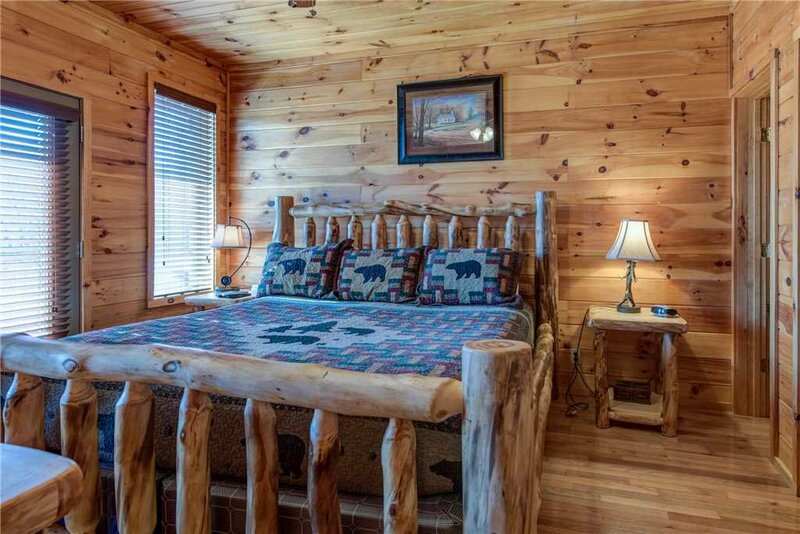 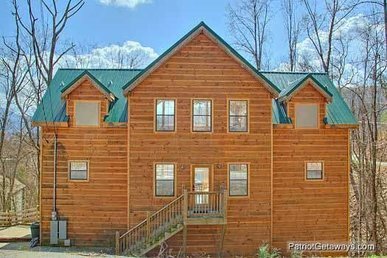 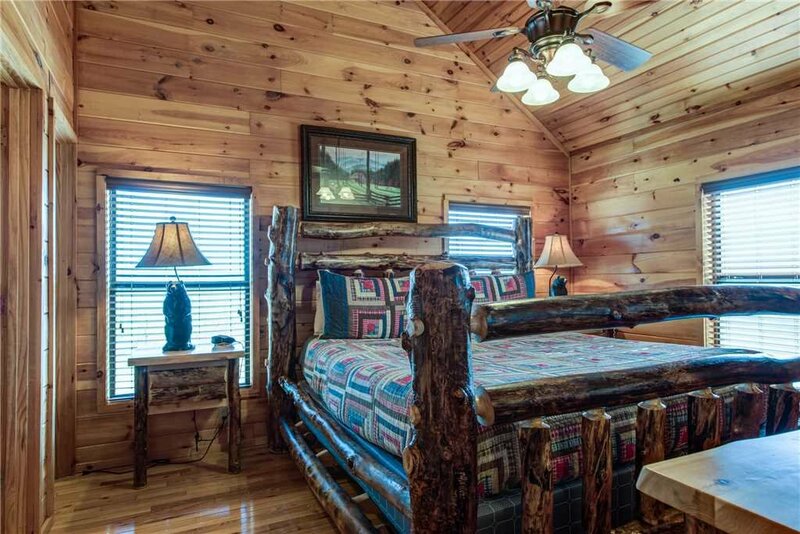 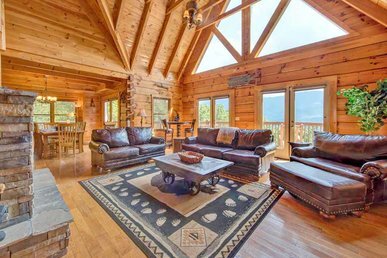 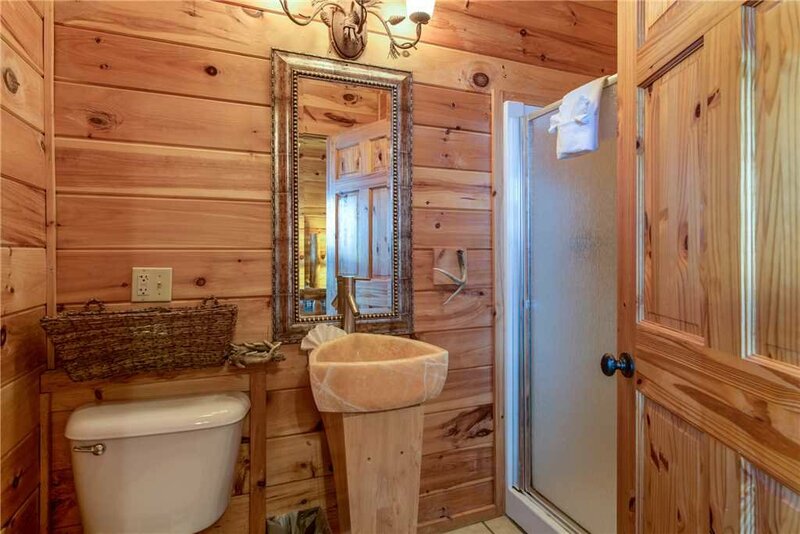 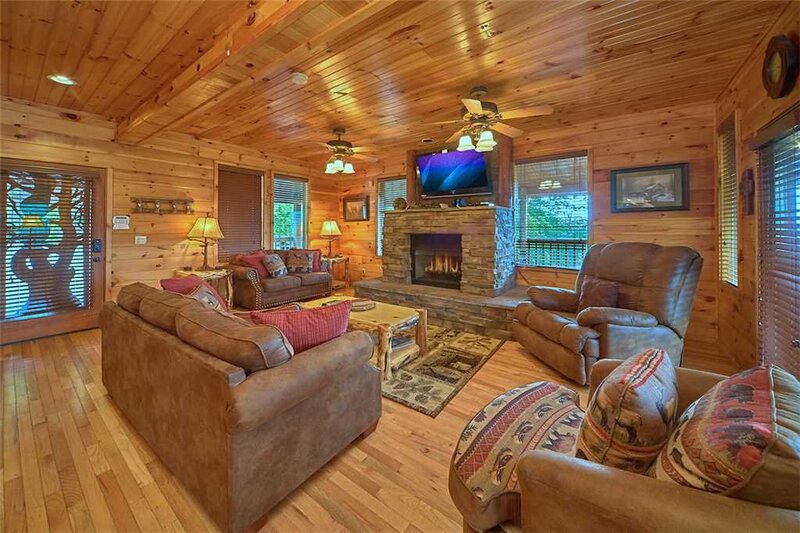 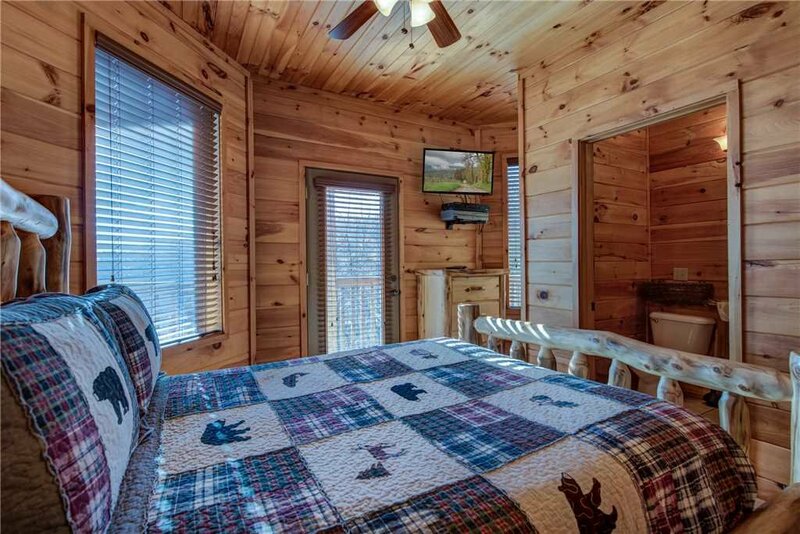 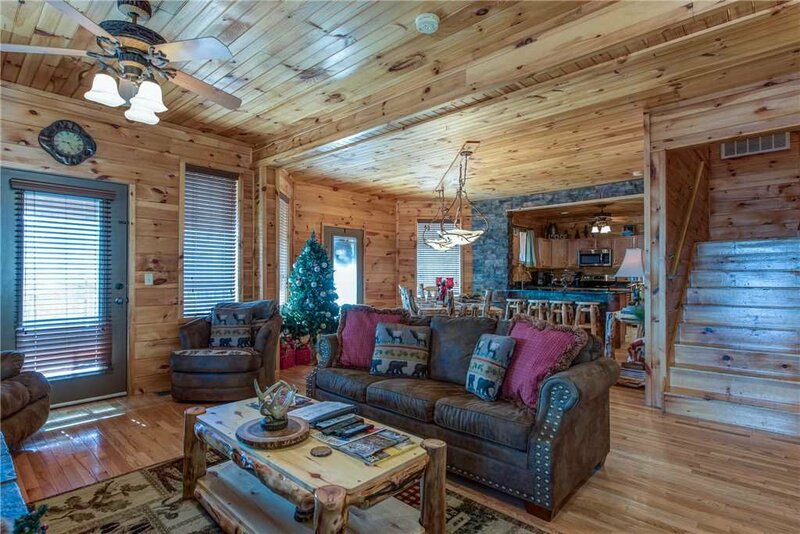 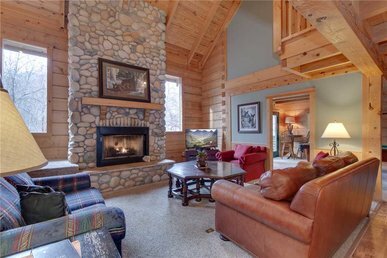 Fun-filled days and starry nights await you at Starry Nights Lodge, a five-bedroom, pet-friendly log cabin overlooking woodlands amid the Great Smoky Mountains. 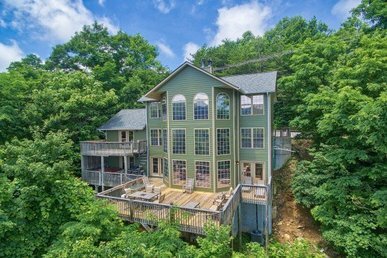 Thanks to its position atop a high ridge, when you step out onto one of the house’s decks you’ll feel as if you can almost touch the clouds and the stars. 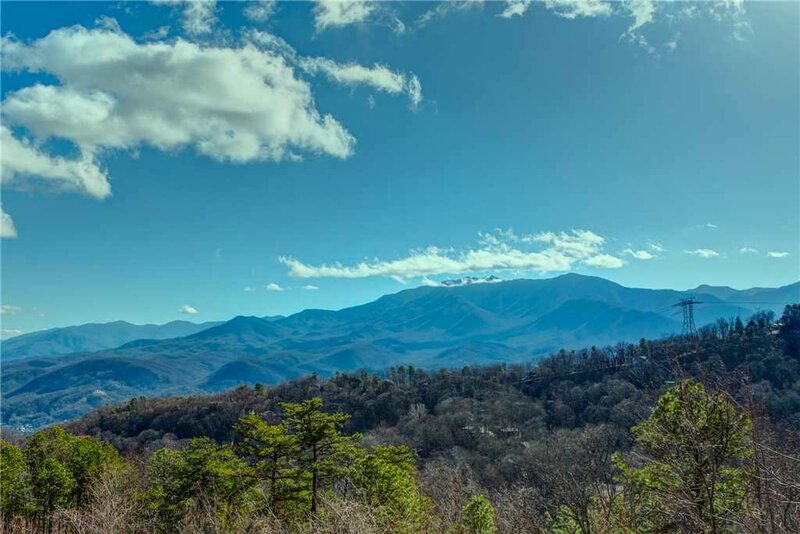 But while the setting may seem blissfully remote, the location is surprisingly convenient: You can drive to restaurants, the Great Smoky Mountains National Park, skiing, shopping, golf, and plenty of other amusement in mere minutes. 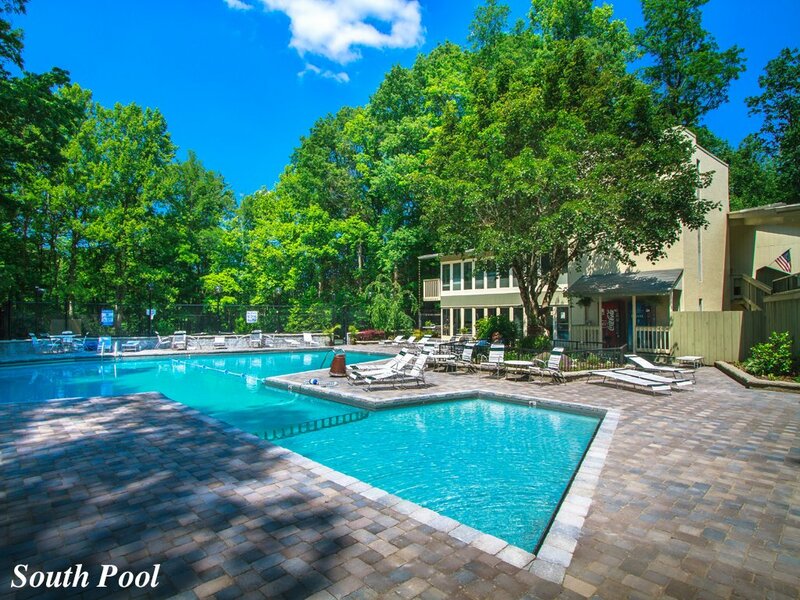 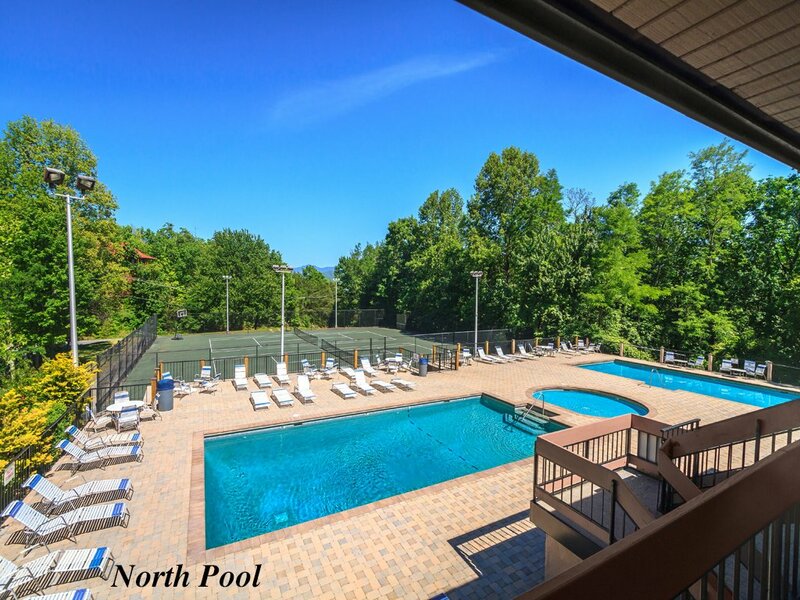 And in the summer, you’ll have free access to three beautifully landscaped pool areas nearby. 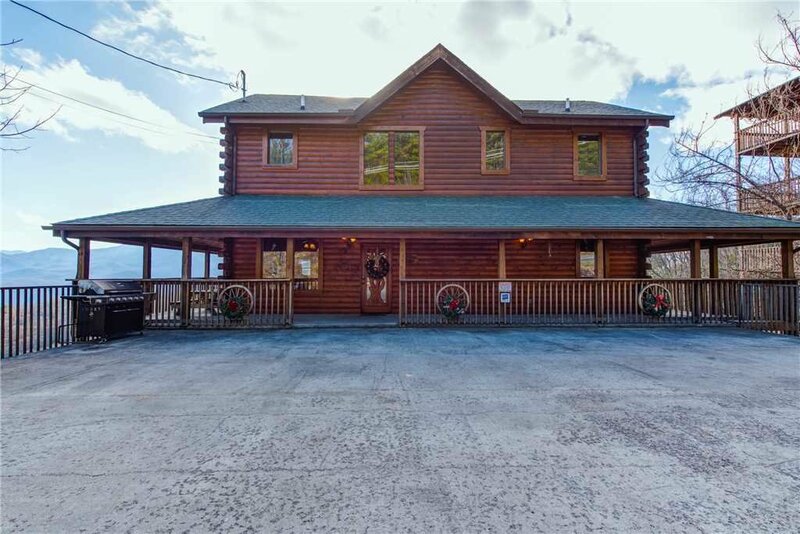 Even without hopping in the car, you’ll find plenty to keep you and your group happily entertained at Starry Nights Lodge. 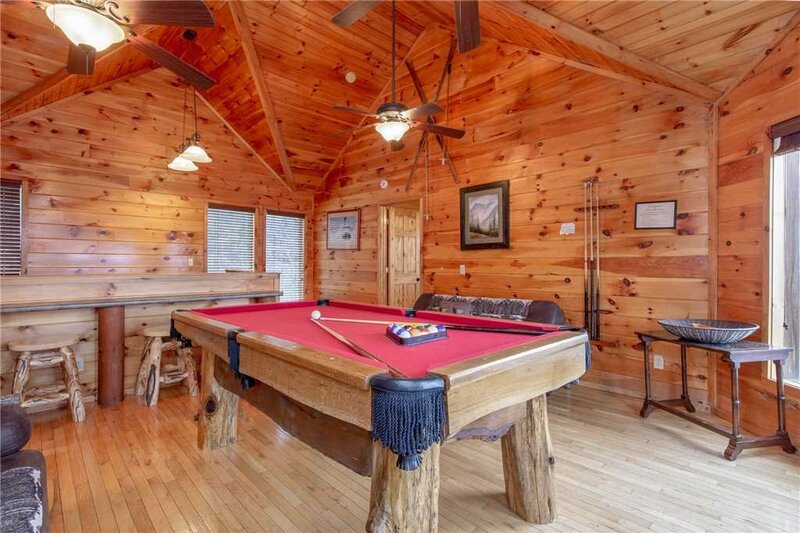 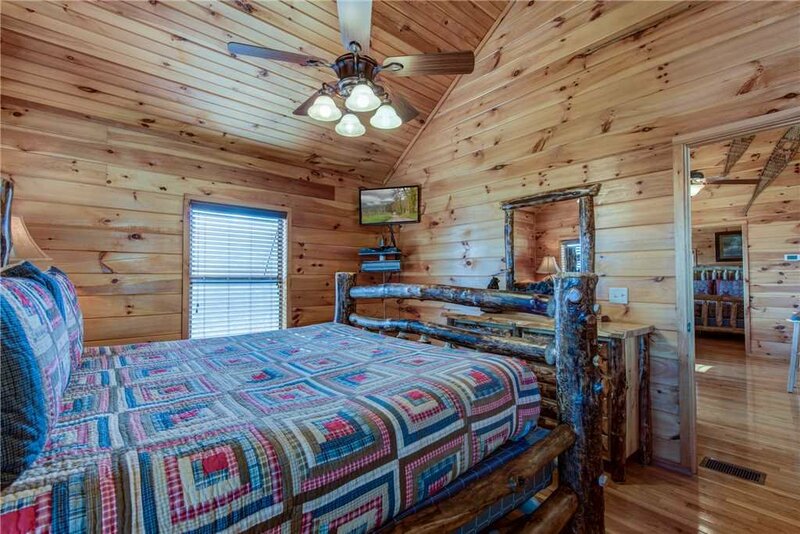 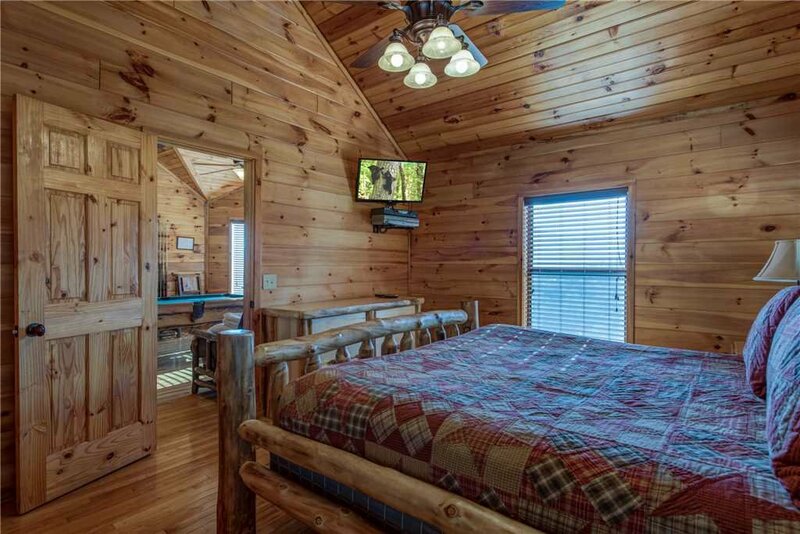 The top floor of the three-story cabin includes a game room equipped with a full-size pool table, a sixty-game arcade table, and a flat-screen TV. 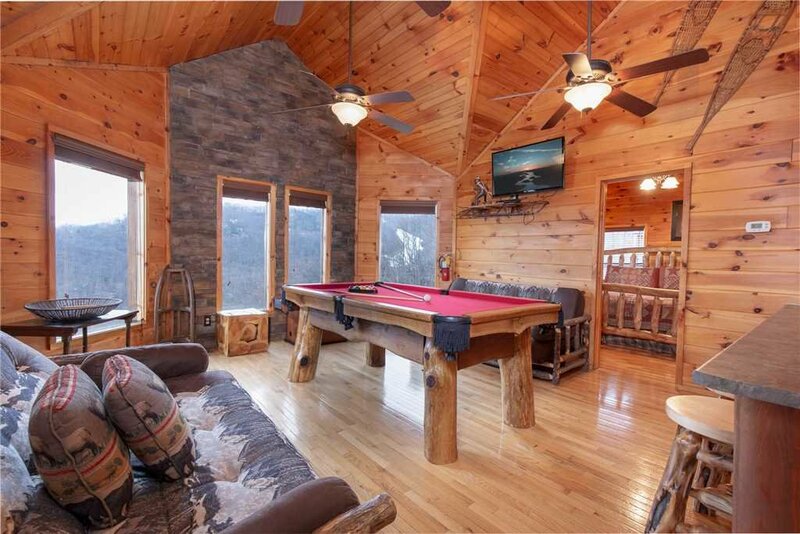 Between games, you can stretch out on one of the two plush futons or catch up with friends at the bar area. 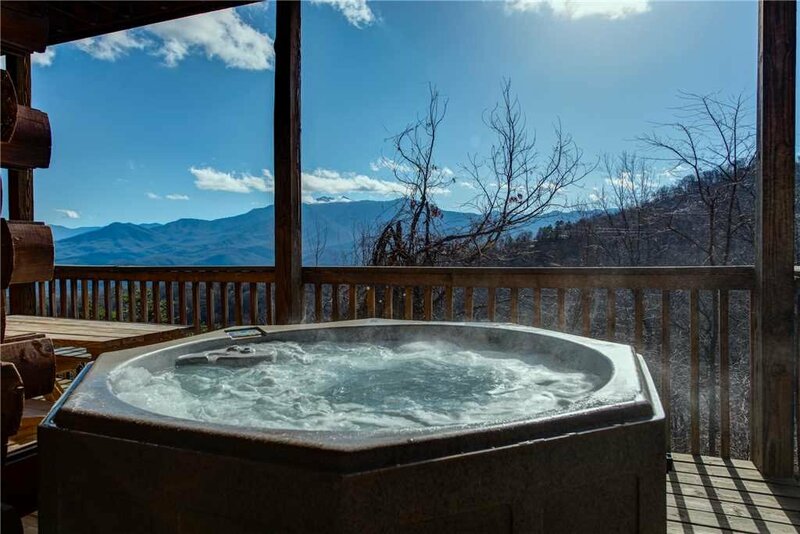 Better yet, head downstairs to one of the two outdoor hot tubs. 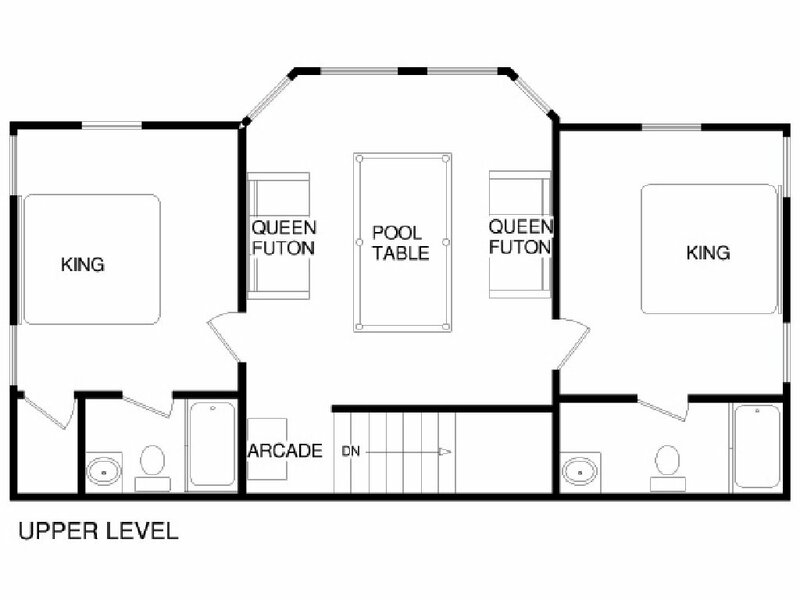 The main-floor deck and the lower-level deck each have a tub of its own. 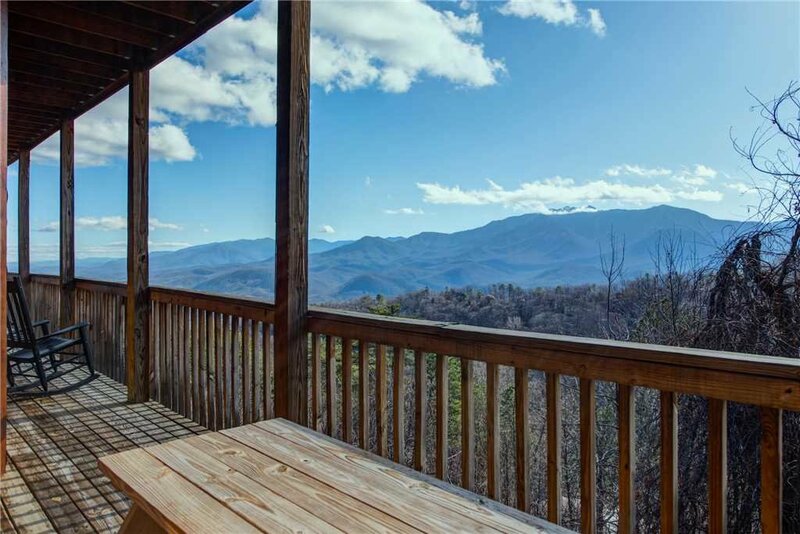 Both are perfectly positioned for optimal views of the mountains—simply breathtaking! 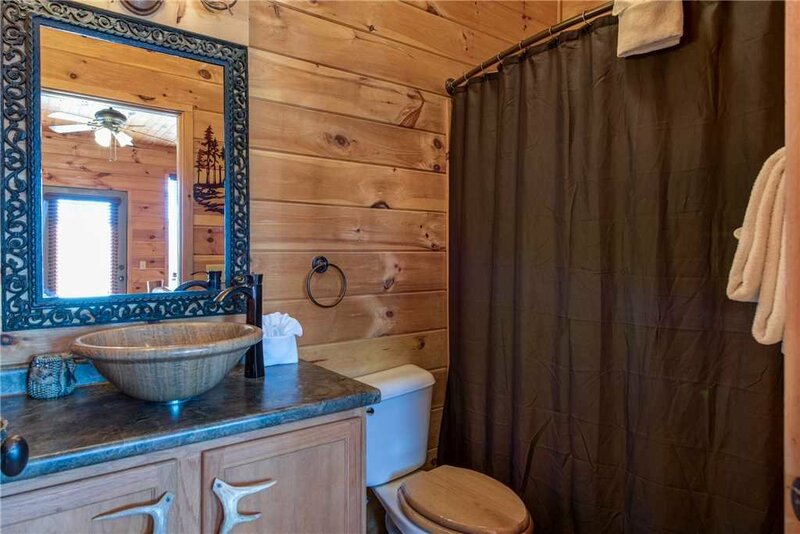 And nothing is as romantic as sharing a steamy jetted soak with that special someone under the silvery light of the moon. 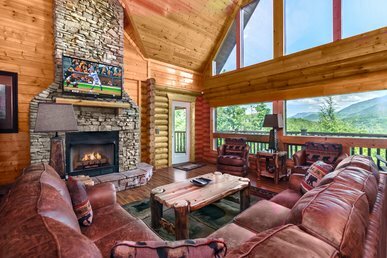 The decks are also furnished with rockers and a porch swing so that you can savor the stunning surroundings any time. 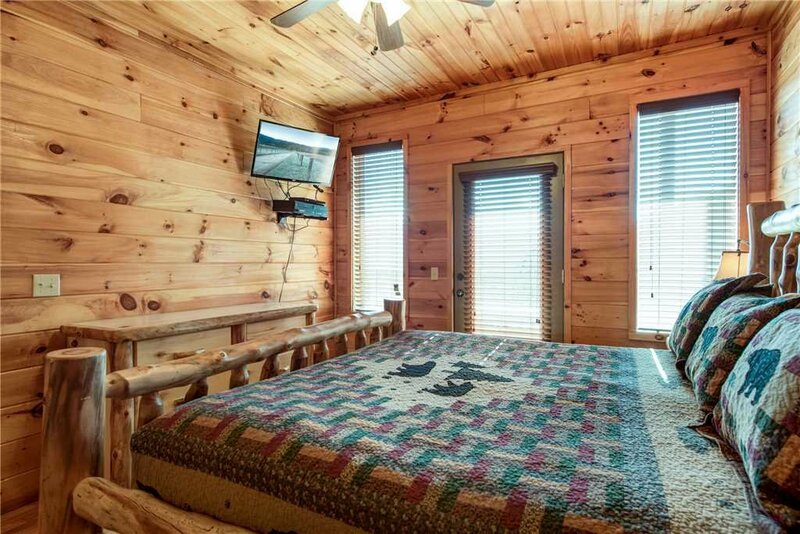 Because the main deck completely wraps around the cabin, you can watch the sunrise from one side and take in the sunset from the other. 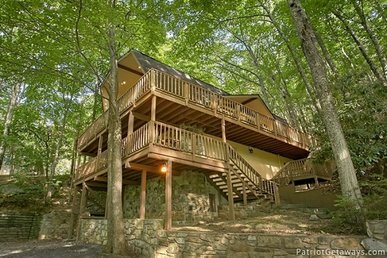 And since the decks are covered, you can happily sit outside with a book and a drink even during the midday heat or a shower. 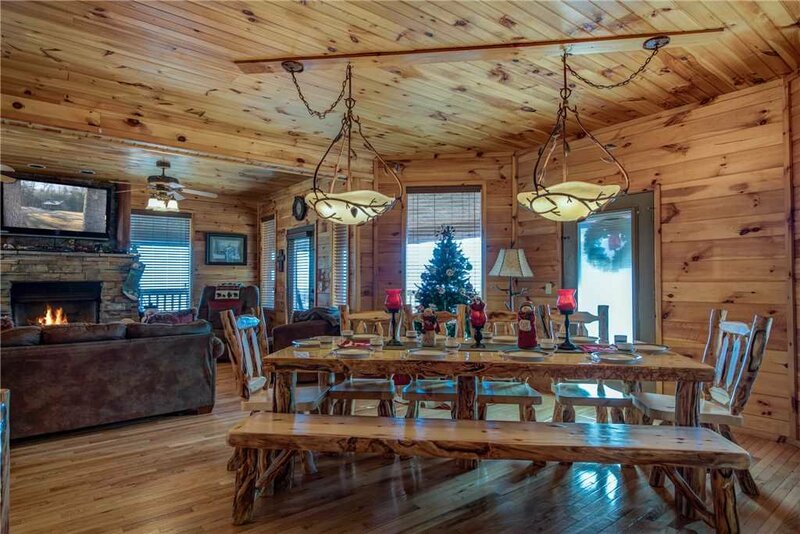 What’s more, you can enjoy your meals out on the deck, courtesy of the picnic table. 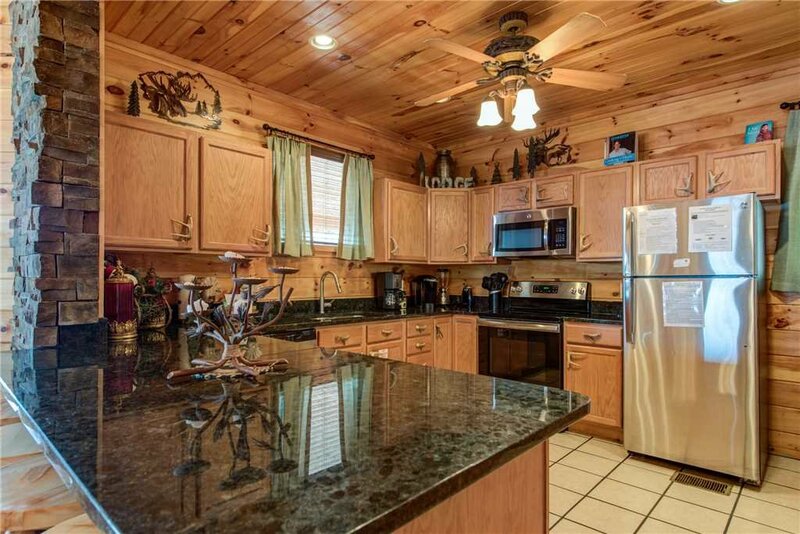 And since you’re dining alfresco, why not cook outside too, on the gas grill? 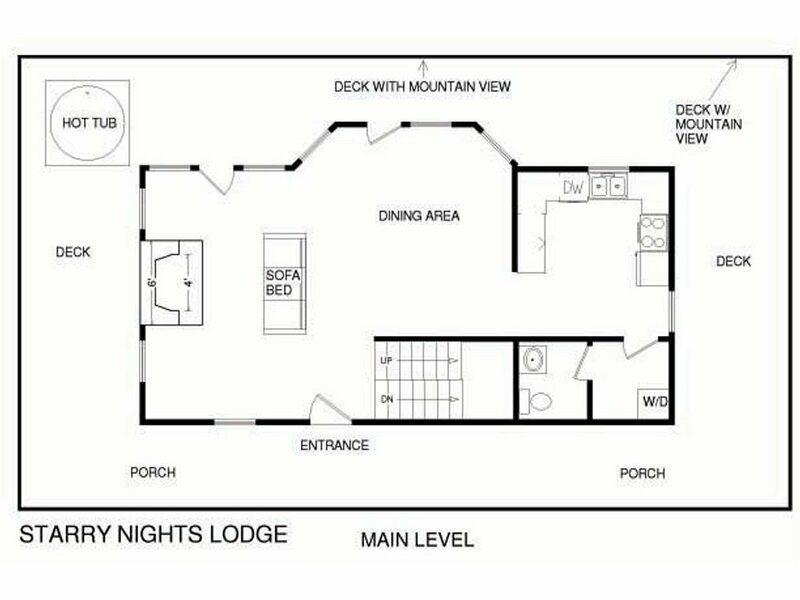 While we’re on the subject of meals, let’s talk about Starry Nights Lodge’s kitchen and dining area, both of which are on the main floor. 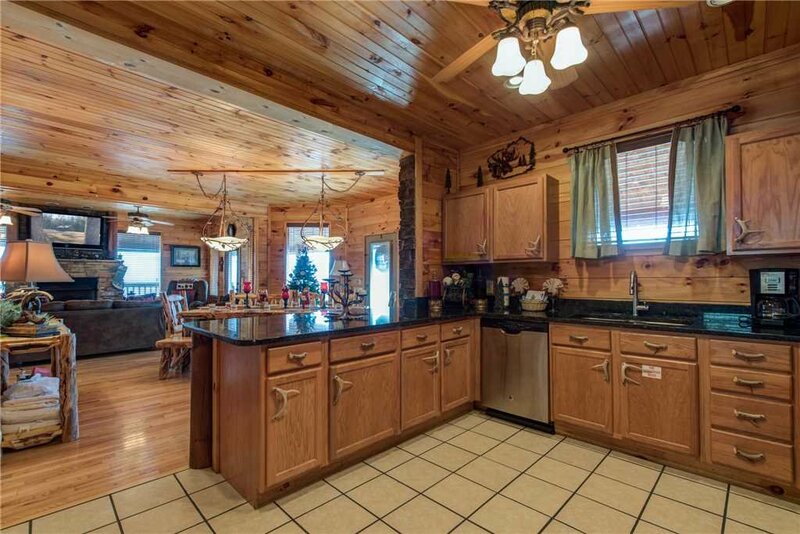 The open kitchen is equipped with all the appliances, cookware, and tableware you’ll need, whether you plan to channel your inner Julia Child or simply microwave popcorn for a late-night snack. 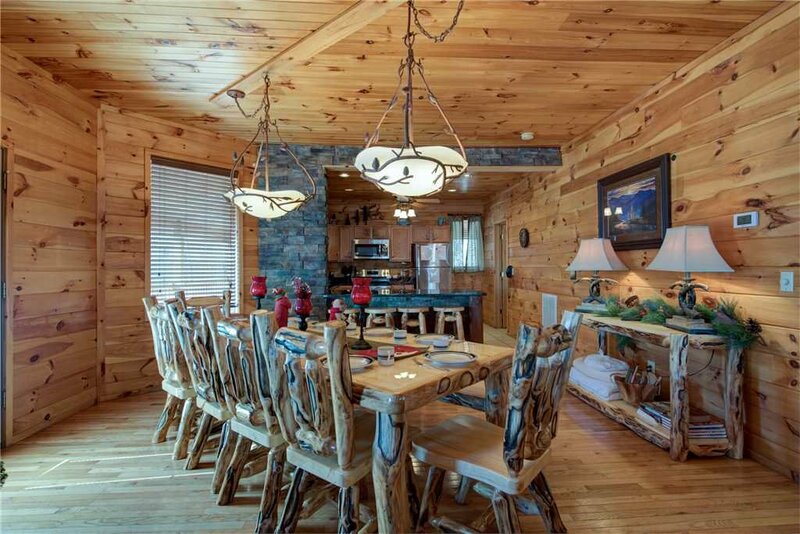 If you do intend for serve up a feast for family and friends, you’ll appreciate the spacious dining table, which easily seats ten. 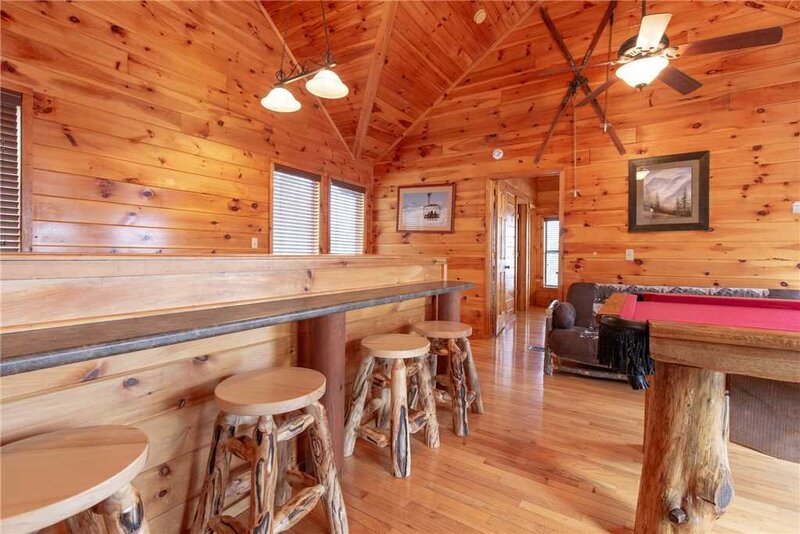 There’s room for an additional three people at the adjacent breakfast bar—the kids will love eating there “by themselves” while the adults enjoy a more leisurely meal. 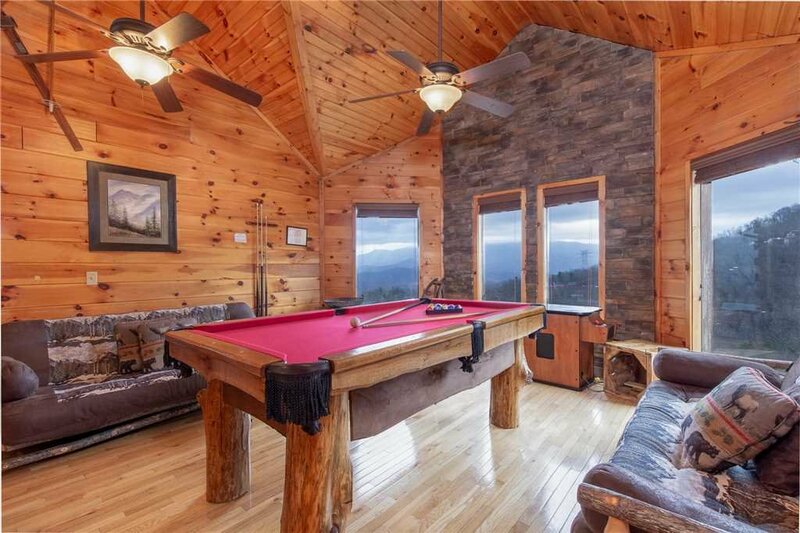 If the kids commandeer the game room after dinner, the grown-ups can decamp to the main floor’s living room. 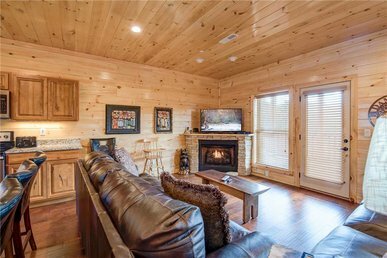 With its luxe cabin decor—roomy roll-arm seating; Arts and Crafts-style tables; burnished wood-plank floor, walls, and ceiling; a stone-surround gas fireplace—it’s a handsome, comfortable space for watching TV, surfing the web, or playing Scrabble. 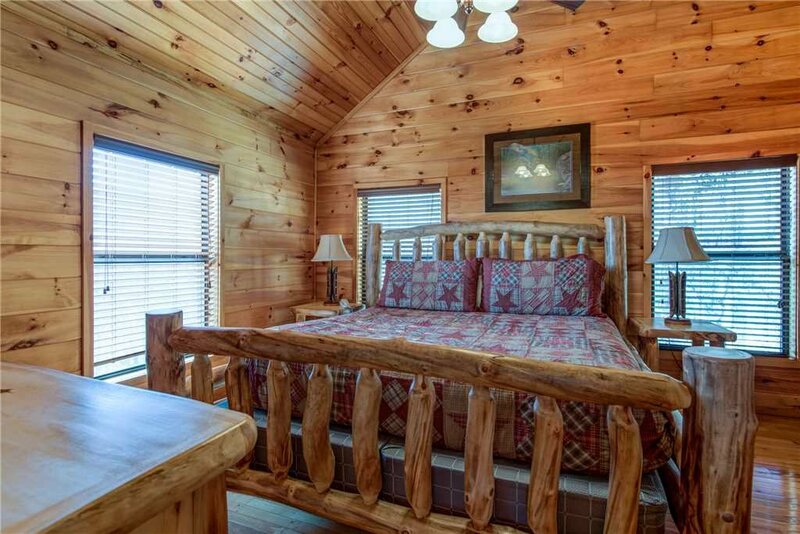 The five bedrooms are furnished to the same high standard. 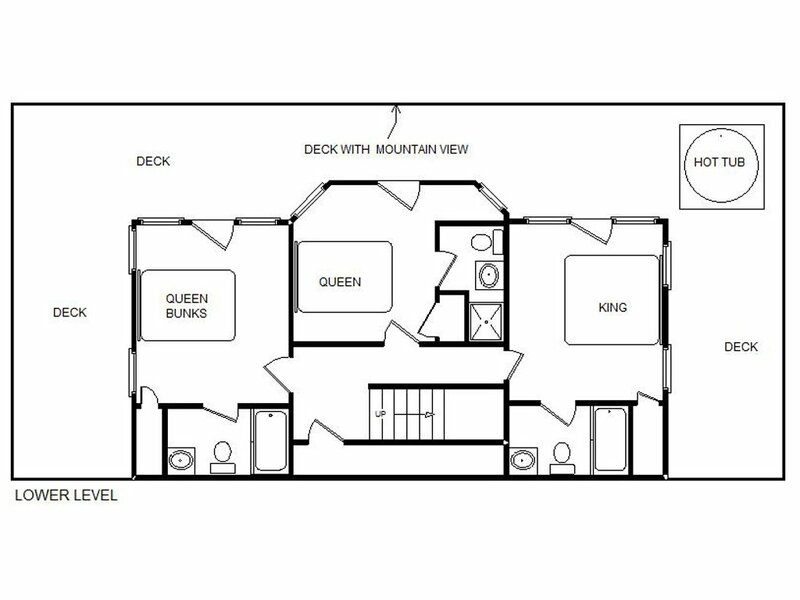 The two bedrooms on the top floor each have a king-size bed; of the three bedrooms on the lower level, one has a king bed, one has a queen-sized bed, and the other has a set of queen bunk beds. 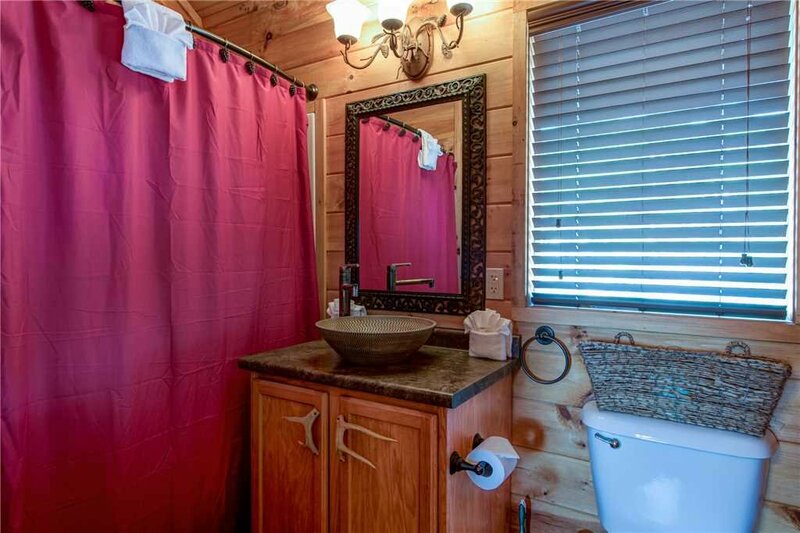 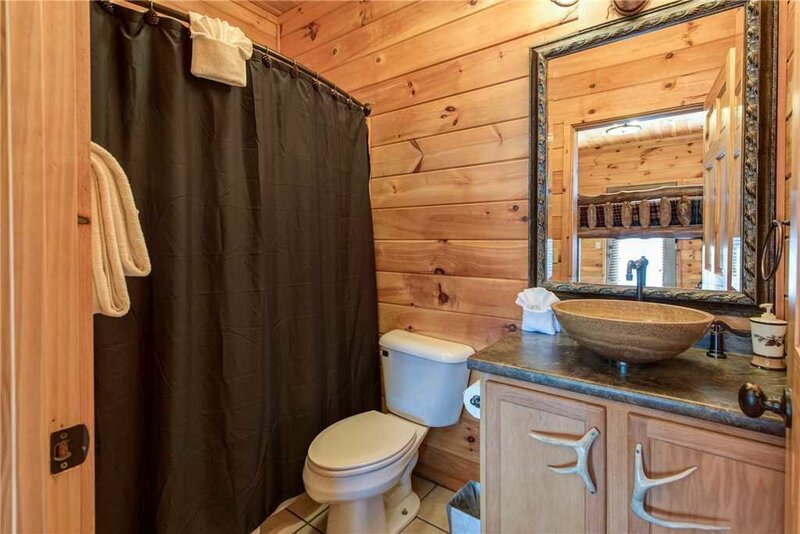 All five bedrooms boast their own private bathroom, a TV, and plenty of storage. 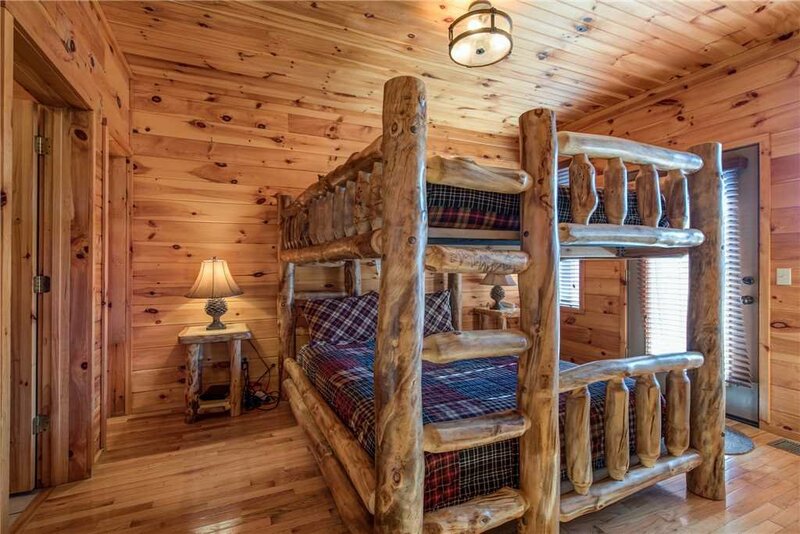 Have additional guests? 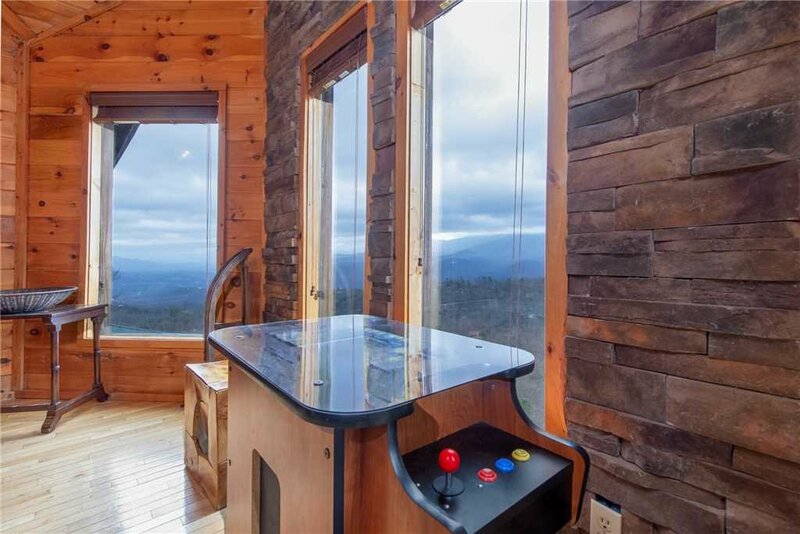 The game room can sleep up to four people—two on each futon—and the sofa in the living room converts to a bed for another two. 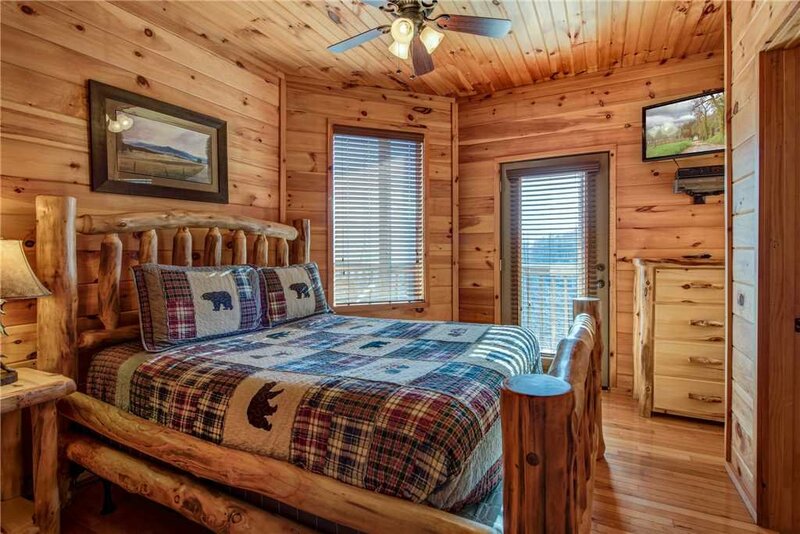 In all, Starry Nights Lodge can sleep eighteen people, making it perfect for a family reunion, a ski trip with friends, or a summer vacation with another family. 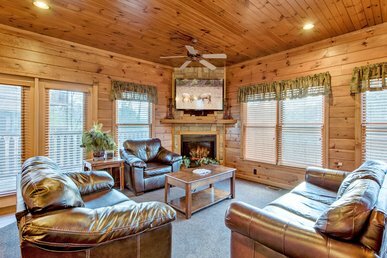 No matter the occasion or the time of year, when you stay at Starry Nights Lodge a good time will be had by all. 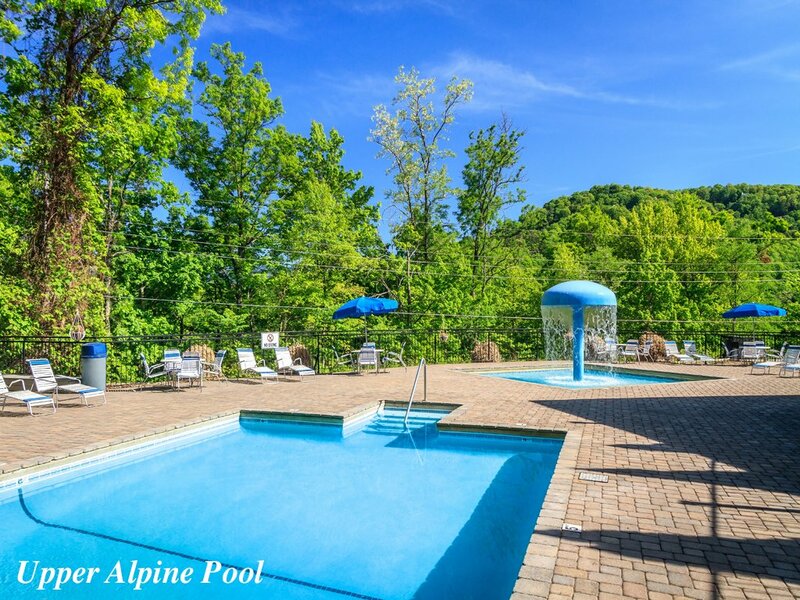 See for yourself: Reserve your stay today, and start planning your best vacation ever.